FIXYOURTHINKING.COM / Need a brain? Borrow mine! : HeadProng Ahead Of It's Time? Could it be possible that Bill Palmer was actually way ahead of the curve and saw a new trend coming where people by the millions would wear their iPods on their head? Thanko of Japan seems to think so. 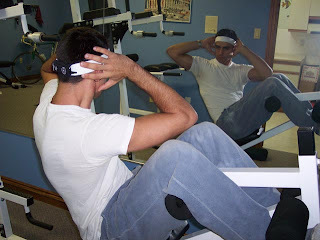 There has to be something weird about this Vonia Sports Headband from Thanko, our favorite manufacturer of all things tacky and wacky with USB ports in them. That or maybe some people get strangely happy when they think they look like Olivia Newton-John. 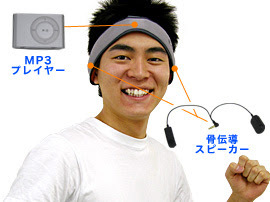 The Vonia is no ordinary 80s headband, though: you can connect an iPod shuffle, put it inside the sweatband's small pouch and start listening to your disco music using bone-conduction technology, which allows you to listen to sound using vibrations, which travel from the emitter to your inner ear using your skull. In theory, this gives you clear sound even in loud environments. And probably a strange tingling pleasure and some liquified neurons too. * yes ... it really is called "HEADPRONG"